All of the President’s advisors understood that Goldwater’s vulnerability in his many reckless statements about the threat of nuclear war—and Johnson slyly made the point in this late August clip with press secretary George Reedy. President Johnson: They’re going to get reapportionment into this platform, which would be awful. It just divides the hell out of it. They’re going to get the Negroes in, and big parades, and that’s going to be bad. I don’t know what we can do about it; I just think we’re going to get this thing in an impossible situation. Just impossible. I just think it’s going to be rioting and killing and murder, just as messy as it can. But I don’t know anything I can do. President Johnson: Yeah. Atom. A-T-O-M.
President Johnson: But you don’t say it. You let it . . . OK. The nuclear issue, as Johnson explained to Labor Secretary Willard Wirtz in this early September clip, allowed the Democrats to profit from the politics of fear. President Johnson: —men becoming sterile, and drinking contaminated milk, and these things, that they’ll know who they ought to be scared of without our ever saying so. And that’s the thing we ought to keep up. And, of course, the campaign implemented this theory in the most famous TV ad in U.S. political history, the daisy spot. 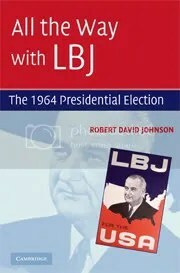 In LBJ’s only recorded comments about the ad—from early October with Willard Wirtz—he worried that the ad had gone too far. President Johnson: Let’s be sure that we don’t get into something like we did on that spot thing, that we’re overdoing it. Willard Wirtz: [Puzzled.] Overdoing the . . .
President Johnson: You remember the little girl pulling the petals out on the [TV] spot, and the bomb going up? President Johnson: —and so forth, and I just don’t want them to think that I’m overdoing it. Larry O’Brien had no such concerns—he reported back that 90 percent of DNC leaders with whom he consulted viewed the daisy ad as the most effective commercial of the campaign.